This example demonstrates how a Boolean NOT function operates when using two layers. The NOT logical operator is typically used in Guardian DRC or Guardian LVS to generate additional (derived) layers that will be used in other operations. In Guardian, the Boolean NOT operation is performed by the DIF command. To run this example, open a Guardian DRC session and choose File->Open to load the project "dif_ex06.eld". Then in the Open Cell(s) form that pops up, select "dif_ex06" and select "OK". The DIF command is used when developers need to generate the difference between two existing layers. 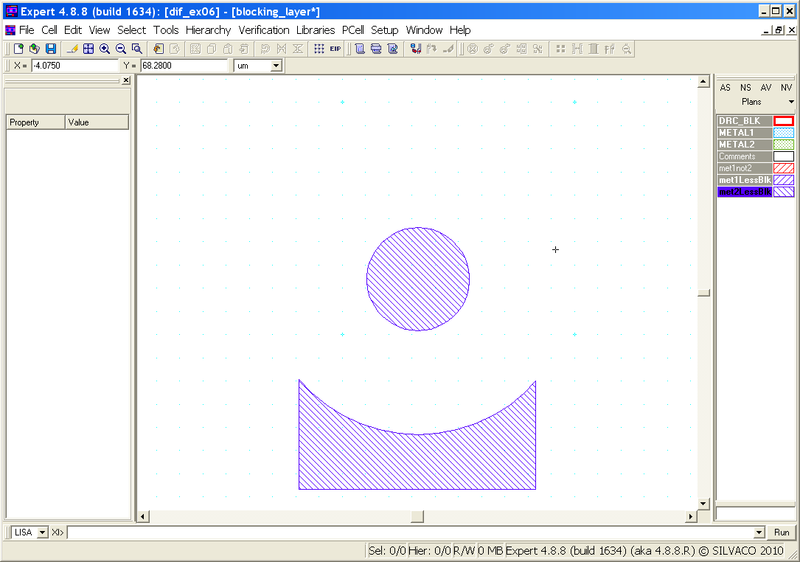 The DIF command returns Layer1 shapes that do not intersect with Layer2 shapes. Two examples of using the DIF operator will be discussed. The first example is based on the DIF illustration shown in Figure 2-18 of the Guardian User Manual. 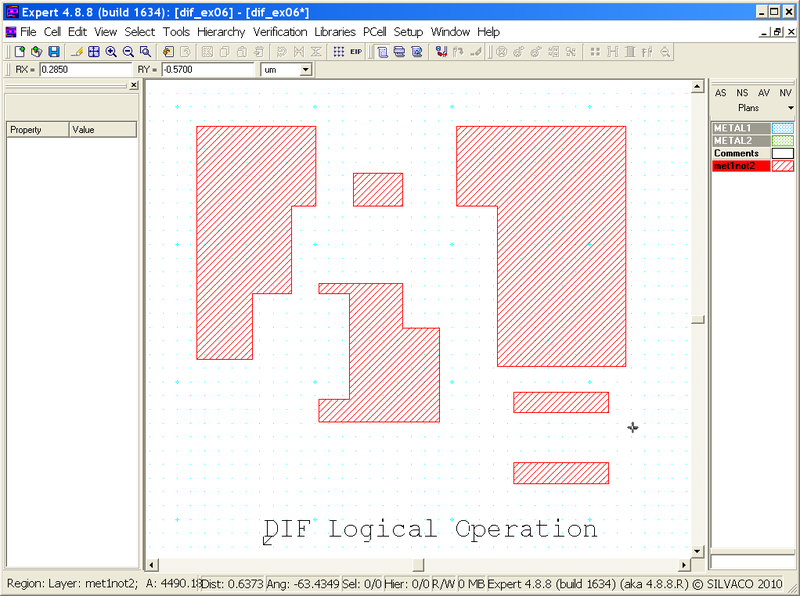 The example cell "dif1_ex06" provided in the "dif_ex06.eld" project illustrates how to use the DIF operator with two layers. An example rule file is shown in Figure 1 . It uses the "METAL1" and "METAL2" layers to create a new layer called "met1not2". 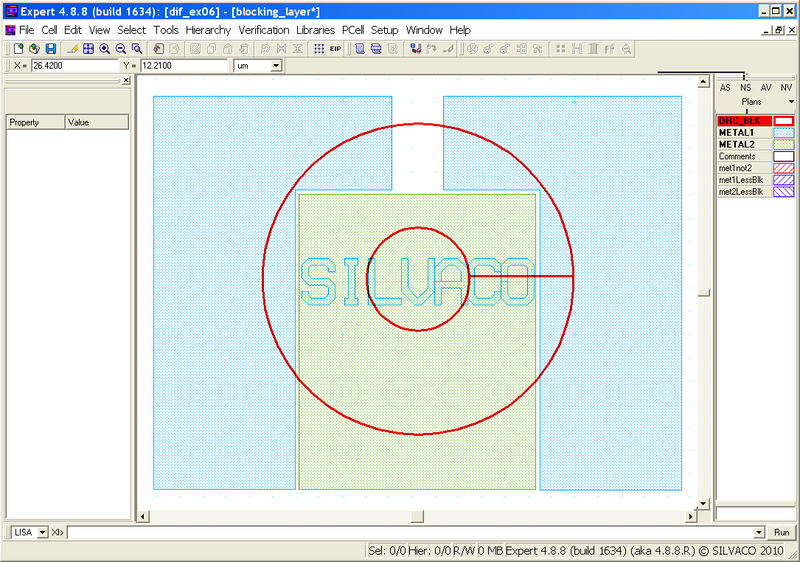 The "Copy" is not necessary, but is used to store the newly generated shape(s) into the layout in order see the results of the DIF operation. The second example, "dif2_ex06", illustrates how to use a blocking layer to ignore or block shapes from being processed during DRC operations. Users may need or want to eliminate portions of their designs from being checked. For instance, a logo or other area of the layout may need to be ignored or not checked. One method is to add a blocking layer over the area to be ignored. An example rule file is shown in Figure 2 , which illustrates how to accomplish this task. Looking at the rule file, the DIF operator creates a new layer by returning Layer1 shapes that do not intersect with Layer2 shapes. The first DIF statement returns all "METAL1" shapes that do not intersect with the blocking layer "DRC_BLK" and generates a new layer called "met1LessBlk". Similarly, the second DIF statement does the same operation using "METAL2", but uses the Logicform command to illustrate the Logicform syntax of the same operation. 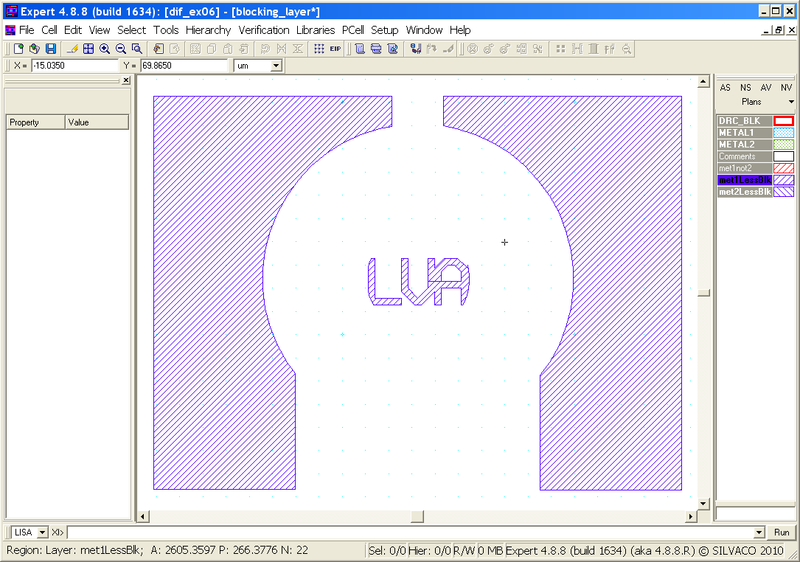 The two "Copy" commands are not necessary, but are used to store the newly generated shape(s) into the layout in order see the results of the DIF operation. Choose Verification->DRC->DRC Script panel . In the new window, choose File->Open ... and select "dif_ex06.dsf". 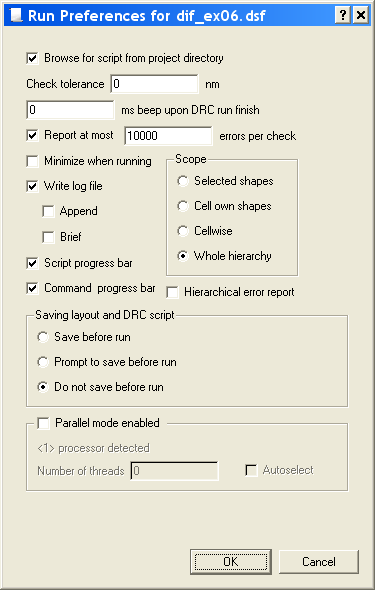 In the same window, choose Setup->Current DRC script run preferences ... and set the options as shown in Figure 4 . Accept the changes and press DRC->Run . To inspect the newly generated shape(s), make the "met1not2" layer active and then turn off all remaining layers using the "NV" button. (To make the "met1not2" layer active, click on the layer`s color strip which contains the check mark). 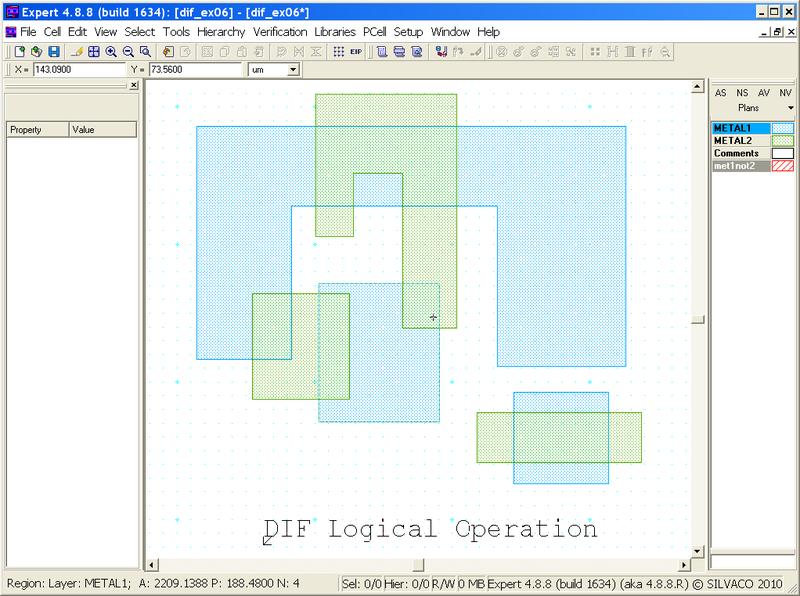 Figure 5 shows the resulting shapes from the DIF operation. Notice how the new layer "met1not2" only contains "METAL1" shapes that did not intersect with "METAL2" shapes. The new layer only contains the "METAL1" shapes that are different or not in common with the "METAL2" shapes. The original layout is shown in Figure 6 . The results for "METAL1" and "METAL2" are shown in Figure 7 , and Figure 8 , respectfully. Repeat the above steps, but use the "dif_blocking.dsf" rule file as input to Guardian DRC. Toggle between the active layers to see the results. Notice how the "met1LessBlk" and "met2LessBlk" layers were formed when the blocking layer overlapped the "METAL1" and "METAL2" layers. To learn more about Guardian DRC commands and their syntax, see the Guardian DRC user manual "guardian_users1.pdf" located in lib/expert/4.8.8.R/docs/ in your installation area.